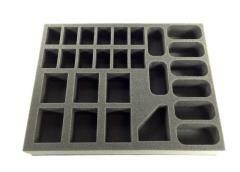 This tray will hold twelve Assault Marines, eight Space Marine Bikes, one Attack Bike and six Centurions. 2 inch (50 mm) thick tray with 12x 2 x 1 1/4 inch (50 x 32 mm) cut outs, 6x 2 3/4 x 2 inch (70 x 50 mm) cut outs and 8x 3 1/4 x 1 1/2 inch (83 x 38 mm) cut outs. Tray Dimensions - 15.5W x 12L x 2.25H" (394W x 305L x 57H mm).